The London-based consultancy Apt created a lovely web app called The Book Seer, which recommends further reading based on a recently-completed book. It's simple really, pulling content from Amazon and LibraryThing to make recommendations. But it has that cozy feeling, like good old-fashioned word of mouth recommendations from a friend. In a time when targeted advertising makes consumers cringe and even personalized services are now greeted skeptically, these no-strings attached services are really attractive. The Seer himself welcomes visitors with a few greetings, including 'Hail fellow', ' O Great Magician', 'Internets!' and 'Ambassador'. 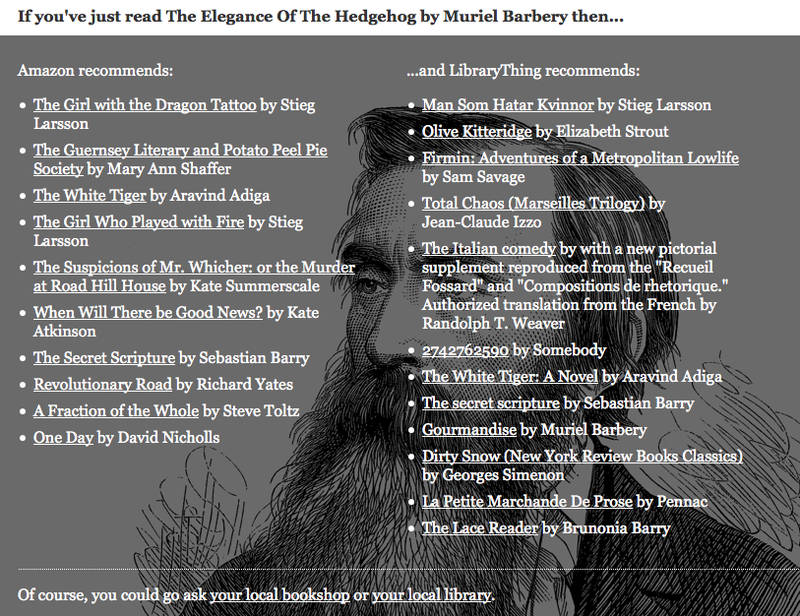 When I typed in 'The Elegance of the Hedgehog' (which I have not actually finished reading), it recommended the books listed in the above image. Interesting to see what they have in common (or not). For instance, both lists recommend books by Stieg Larsson, but none of the same titles. And only LibraryThing recommends another book by Barbery. Perhaps, without an accessible algorithm that has determined my behavior, preferences, and known languages, Amazon is hesitant to recommend a book in French. Ce n'est pas une surprise.